Among the Law School’s current students, there are a musical theater star, a former Supreme Court intern, an entrepreneur, a two-time national softball champion, and a mixologist. The collective backgrounds of the Law School’s student body provide an academic environment that is both enlightening and challenging. Each student’s experiences urge him or her to examine the legal field through a unique lens, and they are constantly learning from and teaching each other. We spoke with five students about the distinctive paths that led them to the Law School and how their past careers have informed their approaches to studying the law. Before coming to the Law School, Julius Carter, ’18, performed in two Broadway musicals and two Broadway national tours—and he stumbled upon his career in musical theater entirely by accident. As an undergrad, Carter considered a few different career paths before deciding to be prelaw and major in history. He was first introduced to performance when he took an elective during the second semester of his sophomore year. “I needed an elective, and someone said, ‘Why don’t you take a dance class?’ and I did, and I fell in love pretty quickly after that,” he said. His passion for dance grew as he continued to take classes, and he ended up switching his major to dance and performance theory with a minor in history. After he graduated, his friends and family encouraged him to pursue a career in dance, and he did, knowing that at some point he would return to law. Carter moved to Chicago and joined a dance company called The Seldoms—it was his first professional gig, and he stayed with the company for about a year. “At some point I realized, perhaps I can go further, because not only did I enjoy dancing, I also liked singing and acting—and the best industry to combine all of those is musical theater,” he said. Though he hadn’t had substantial training in acting, he began auditioning for musical theater shows. Chicago, he said, was the perfect environment because many productions begin in the city. He auditioned for Movin’ Out, in part because of the show’s emphasis on dancing, and ended up getting cast in the musical’s only speaking role. 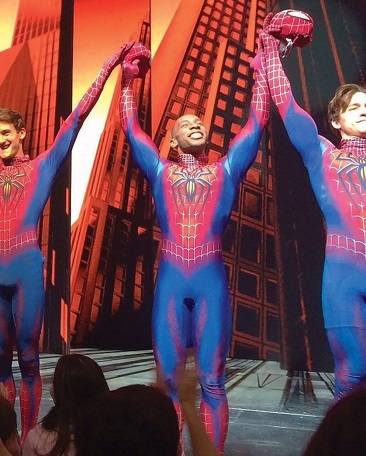 After Movin’ Out, Carter was cast in the Broadway musical Spiderman: Turn Off the Dark, which he performed in for two years, and, later, On the Town. It was around the end of his time with Spiderman that he thought again about applying to law school. Carter hopes to combine his experience in theater with his forthcoming JD by pursuing a career in entertainment law. He began law school at the University of Iowa, but decided to transfer after his first year. He filled out just one transfer application, and chose the University of Chicago for its outstanding faculty, knowing that he would one day want to teach law as part of his career. At the Law School, Carter said, fellow students and faculty have encouraged him to use the skills he honed as a performer in the classroom. For instance, once when he was working through an assignment for a legal writing class, his professor suggested that he think about it as a monologue he might deliver on stage and simply tell the story. Aisha Noor, ’17, has a bachelor’s degree in political science, a master’s degree in public affairs, and soon will have a JD from the Law School—but technically, she doesn’t have a high school diploma. Because of an administrative mix-up during her junior year of high school, her GPA went from being one of the highest in the class to the bottom third. Amid efforts to fix the error, she met the dean of the honors college at the University of Texas at Dallas. After hearing her story, he wanted to help amend the situation. Noor was admitted into the honors college and began at the age of 16. There, she joined the university’s Innocence Project—an organization that gave undergraduate students the opportunity to help exonerate the wrongfully convicted. During her senior year of college, Noor won a Bill Archer Fellowship and moved to Washington, DC, for an internship in the curator’s office in the US Supreme Court. There, she worked on developing public education programs for the Court and learned everything she could about the Supreme Court so she could teach visitors about its history. “The thing I loved most was that one to two times a day, I got to take about a hundred visitors into the courtroom and give them a lecture about the rich history that has unfolded within those walls—where we still don’t allow cameras—and teach them about the branch of our government that most people know the least about,” she said. 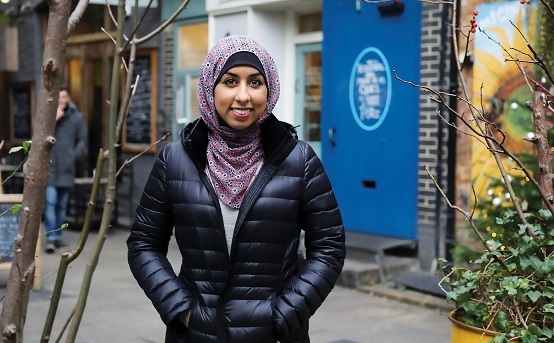 Noor, who is Muslim and wears a hijab, often felt responsible for proving herself to the visitors, who seemed surprised to see someone who looked like her working at the court. It took effort, she added, but was worth it if she could change their perceptions. After completing her master’s degree, she applied to law school and was drawn to the University of Chicago after learning about the Kapnick Leadership Development Initiative and its emphasis on teaching lawyers to be leaders and team players. She also sensed that the student body was as focused on academic inquiry as she was. Overcoming the hurdles that led her to UTD, Noor said, taught her the importance of making the best of a difficult situation and offered her valuable perspective. At the Supreme Court, she got a different kind of perspective, and one that has stayed with her throughout law school. When Micah Kamoe, ’19, moved to India to do consulting for an education-focused nonprofit, he didn’t expect that would also help start a business. The nonprofit, Food for Life, was located in Vrindavan, which is the birthplace of Hinduism’s Hare Krishna sect. The religion, he learned, places importance on drumming and dance in its worship services. “I’m a percussionist, so I would go to the services for that reason—to learn about different drumming techniques and have the opportunity to jump in and try out new things,” Kamoe said. At one of the services, he met a recently unemployed teacher named Gopal, whose family had once run a business selling musical instruments. The business closed after Gopal’s father passed away, but they still owned the property and the building was located right at the city’s entrance. As they worked to restart the business (called Kishori Music Store), they encountered a number of obstacles—how would they find suppliers? Where would they access the funds to invest in the new store? What audience would they target? They traveled throughout India to find suppliers, and Kamoe helped fund the business with money from his and his wife’s student loans. Their target audience, they decided, would be the westerners who visited for Hare Krishna festivals; the store’s location at the city’s entrance made it ideal. The business didn’t fail. In fact, it broke even in three months, and still supports Gopal and his family to this day. After leaving India, Kamoe interned for US Senator Mark Udall of Colorado, worked as a bank manager, and earned a master’s degree in American Indian Studies at UCLA, where his thesis examined entrepreneurship in native communities. It was his interest and experience in entrepreneurship that ultimately led him to apply to law school. Since he’s been at the Law School, his ambitions have evolved—now, he said, he wants to work with new business owners at a firm that focuses on emerging companies. Kamoe chose the University of Chicago primarily for its efforts to bridge the gap between law and business with programs like the Kapnick Leadership Development Initiative and the Doctoroff Business Leadership Program. Knowing that he could supplement his legal education with MBA courses from the Booth School of Business made the Law School a perfect fit. 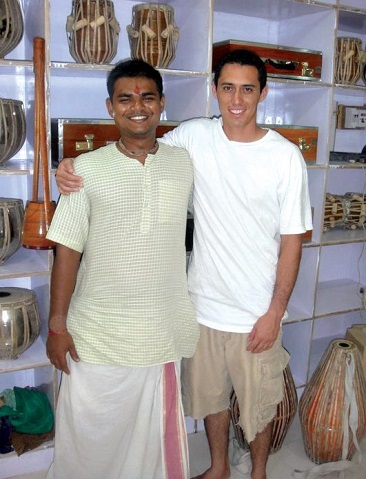 In the classroom, he often refers back to the challenges he encountered when he opened the Kishori Music Store in India. María Mondeja Yudina, LLM ’17, grew up in Cuba and from a young age questioned why her country worked the way it did. It was these questions that led her to want to become a lawyer. Soon after getting a law degree and practicing law in Cuba, she realized that the legal work there wouldn’t challenge her for long. She had grown increasingly interested in business law, and this field was difficult to explore in Cuba. Her brother had recently moved Chile, and she decided to look for work there, eager to learn about the practice of law in a different country and economic system. At the law firm in Chile—which specializes in corporate and investment law—she had to learn a lot in a short amount of time. There were big differences between practicing law in Cuba and Chile, Mondeja said, including the working culture, the projects, the business practices, and the relationships with clients. At the same time, she found that her unique situation allowed her to better relate with many of her international clients. Mondeja has always enjoyed playing sports, and is a two-time national softball champion in Chile. 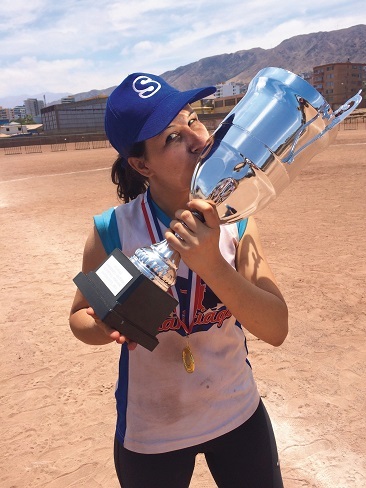 When she began working at the law firm in Chile, playing on the softball team helped her manage the stress of practicing law in a new country. Mondeja earned an LLM jointly from the University of Chile and the University of Heidelberg in Germany, focusing on international law as it relates to investments, trade, and arbitration. After working at the firm in Chile for four years, she decided to pursue an LLM in the United States. Mondeja won a scholarship from the Chilean Comisión Nacional de Investigación Científica y Tecnológica that made it possible for her to attend an LLM program in the US. She ended up choosing the University of Chicago because the LLM alumni were helpful in answering questions about the program and because she felt supported by the Law School throughout the admissions process. At the Law School, Mondeja appreciates that the smaller LLM class size has given her the opportunity to better get to know her classmates, and during spring break she will travel to Singapore and Hong Kong for this year’s International Immersion Program. On campus, she is still involved in sports and has played volleyball with the University’s Divinity School and flag football with the JD students. After graduating from the University of Alabama in Huntsville with a degree in philosophy, Reeves Jordan, ’17, moved to Tennessee to join a progressive rock band. Jordan stayed with the band for a few months, performed solo for a while afterward, and eventually moved back to Alabama, where he started bartending. He’d earned money as a bartender in college, but he had no idea how much he would enjoy it when he returned. Jordan ended up securing a position as head bartender at Cotton Row Restaurant. At first, he wasn’t convinced he was qualified for the role, but he grew into it. After working at Cotton Row for about three years, Jordan began thinking about applying to graduate school. For a while, Jordan was torn between going to law school and getting a PhD in philosophy. He ultimately chose law for its outward focus and day-to-day interaction with people—which was one of the things he loved about working at Cotton Row. Jordan was drawn to the Law School for its emphasis on analyzing every side of different legal concepts and studying the relationships between law, business, and economics. 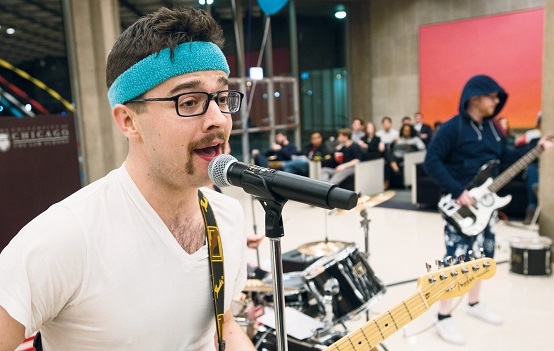 At the Law School, Jordan—who will work in litigation at Paul, Weiss, Rifkind, Wharton & Garrison LLP in New York after graduation—continues to play music, and is in a band of Law School students called Tortious Interference. He has also found that the craft of bartending has applied to his work in the legal field.